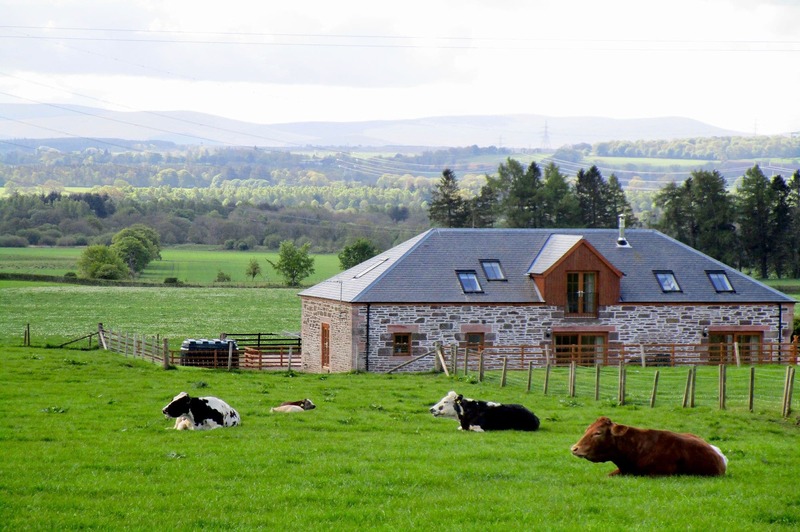 The Distillery is a luxury farm holiday cottage. The building dates to 1819 when it was a distillery and has been renovated to a high standard of accommodation. 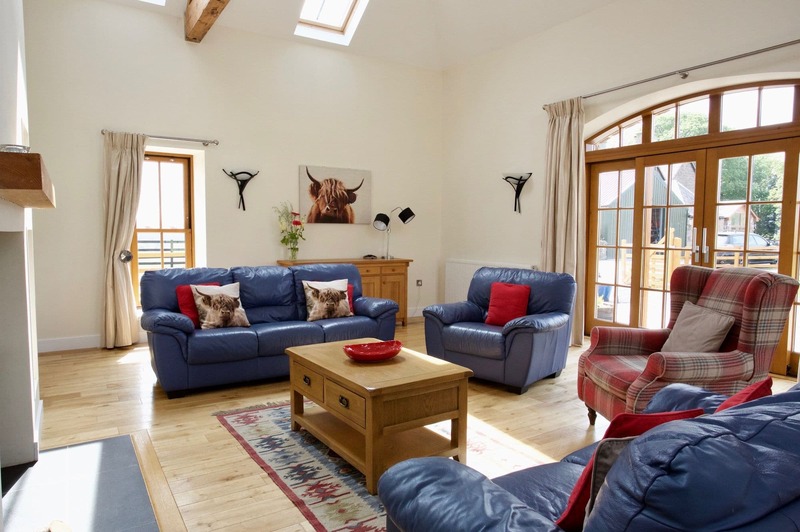 Visitors will enjoy this peaceful setting, just a mile from the market town of Crieff in West Perthshire. A perfect haven in the countryside with town amenities on hand. The Distillery prides itself on being accessible and welcomes wheelchair users. There is a downstairs bedroom with en-suite showerroom and two further en-suite rooms. 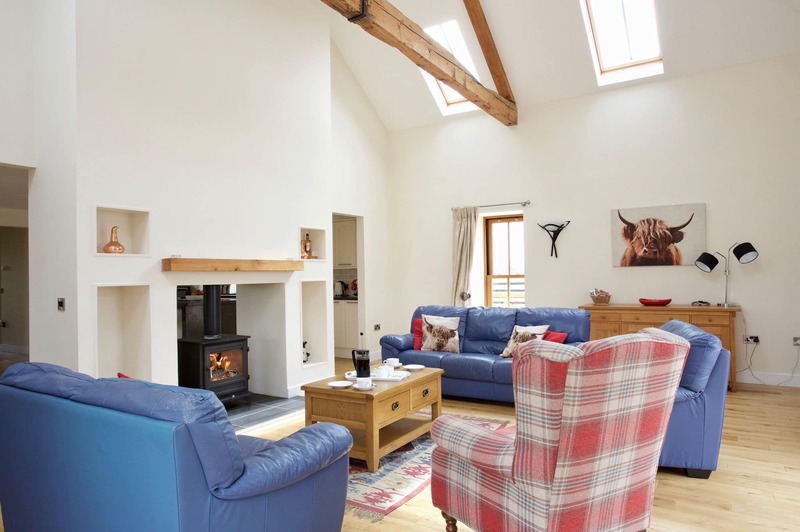 The cottage has been stylishly renovated and features the traditional beams in the full height lounge, a double-sided woodburner, and is maintained to a high standard. There is ample parking available outside the property. There is a double bedroom downstairs with en-suite jack-and-jill style bathroom that can also be accessed from the hall. 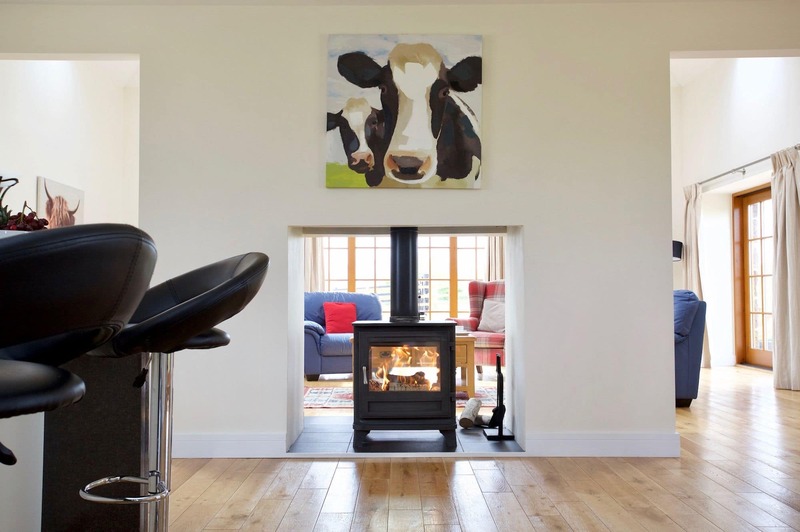 The house features a spacious open-plan double height ceiling sitting room separated from the dining/kitchen area with a handsome double-sided wood burner (fuel supplied). The floors are oak throughout and there are three sets of French doors leading on to a terrace. The wall mounted 42″ TV has Freeview Channels. The dining table seats 6 and the fully fitted kitchen area has a breakfast bar with two stools, fridge freezer with ice making, hob, double oven, dishwasher and microwave. The spacious utility room has coat hooks, sink, washing machine and tumble drier, a large cupboard with shelving and access to the terrace. There is a fully enclosed garden. On the upper floor there is a large king sized double bedroom with dressing room and en-suite with a double ended bath and walk in power shower with rainforest and second shower head. French doors overlook the garden and there is a wall mounted 32 inch TV and two easy chairs. 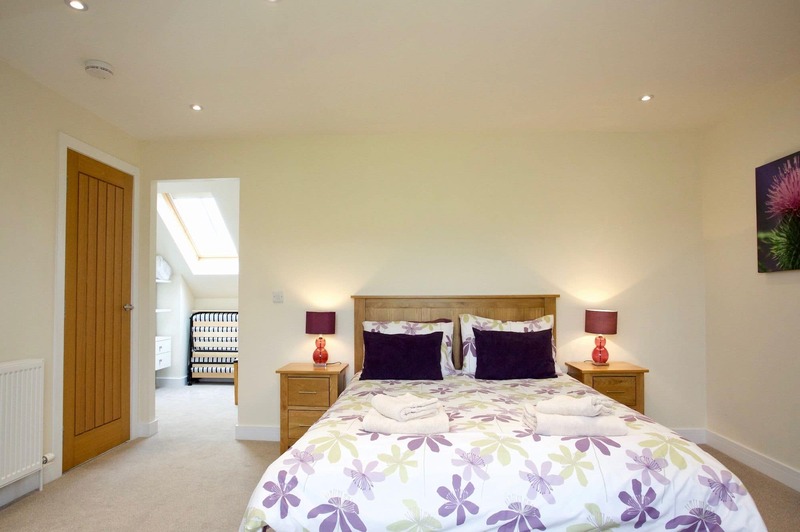 The twin bedroom has fitted wardrobes and an en-suite with large bath and power shower. The owners have created a beautiful and spacious house, retaining many original features. Accessed by a short private tarmac road, there is ample parking around Distillery Cottage which sits on its own ground away from the owners’ property. Surrounded by fields and interesting landscape visitors can take a 15 minute stroll via a local path network into the Highland town of Crieff. There is a swimming pool not far away at the local Community Campus and there are numerous leisure opportunities at the Crieff Hydro, from tennis, golf, horse riding, swimming, mountain biking and beauty salons. The town itself is well served with a good range of places to eat out and visitor attractions include The Famous Grouse Experience, Stuart Crystal, Crieff Visitor Centre, Bennybeg Garden Centre, The Ceramic Experience, Drummond Castle Gardens and Innerpeffray. Golf Courses abound, with around 40 in Perthshire alone. In the immediate area, golf at Crieff, Muthill, Comrie, Gleneagles, Auchterarder and Dunning. There are lovely walks too, on The Knock, Lady Mary’s walk and others. Travelling further afield, head north via the scenic ‘Sma Glen to Dunkeld or Aberfeldy, Pitlochy and Lochs Tay and Rannoch. Head west to Comire, Lochearnhead, Killin, Glen Coe and Fort William, and Oban, Dunblane and Glasgow. Head east to Perth, Dundee, Fife and St Andrews and the Angus Glens. Head south to Edinburgh, Stirling and the Falkirk Wheel. Gleneagles Golf Courses 10 miles, Edinburgh and Glasgow airports around an hour by car.